In the scope of sensorics techniques and components for identification and detection of substances and factors due to their chemical or physical interaction with the measurement device are developed. The pathbreaking application areas are safety engineering, biotechnology, pharmaceutics and environmental technology. One strategic issue of the development is the targeted combination of alternative materials with an application adapted device architecture. 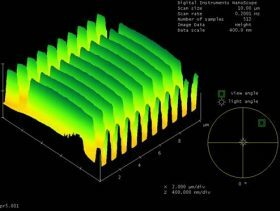 The component design is supported by numerical simulation taking device geometry and material parameters into account. For device fabrication the researchers access accumulated know-how for material processing as well as established and innovative nanostructuring and replication technologies of AMO. Below, in a short summary an overview of current research projects is given. Most of them are joint projects with competent partners across Europe funded by the EU commission. In project VAMINAP the partners are combining their experiences in spectroscopy, photonics and computing to find potential toxic contaminants in the water outlet of recycling plants. Remnants of pharmaceutical products, micro-plastics and nanoparticles are being filtered and identified using spectroscopic approaches. Here, AMO is working on improving Raman-Spectroscopic intensities using numerical simulations and nanofabrication. The focus of interest is the enhancement of the photonic/plasmonic interaction on a nanostructured surfaces to gain strong SERS (Surface Enhanced Raman Scattering) – effects on chip level. In the European Regional Development Fund project AMO is engaged in the development of innovative optical components for biochips based on fluorescence techniques. There the main emphasis is paid to the realization of micro cavities with very narrow apertures, which means to face the challenging realization of apertures of less than 100 nanometers. The aspect ratio counts with the structuring of quartz substrates, the information of the nano apertures and the homogeny of their apertures. ATLASS is a European project motivated by the appealing applications scenarios and the considerable progress that has been made in solution processing of organic semiconductors for OFETs. The project aims at the development and application of appropriate organic semiconducting materials and processing environment based on R2R-replication processes down to the nanoscale. AMO will bring in its capabilities on the “nanoside” of the project for the generation of masters and templates for R2R and the characterization. The integration and the 3D-replication of multilevel objects (IR-lenses) is essential if a combined sensor skin with piezo- and pyroelectric properties is to be developed.